Banknotes There are 8 products. 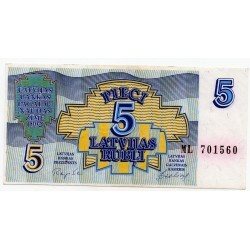 Country and Pick Number: Latvia ; Pick P- 35 First year of issue: 1992 Denomination and currency: 1 Rublis Issue type: uncirculated Signature(s): E.Repše;J.Ozoliņš Description of paper money: Banknote 1992; violet on yellow and ochre underprint. Series CK 660937 Back –violet – brown on light green and yellow underprint.Watermark: summetrical design. 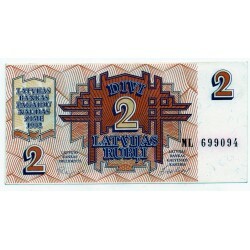 Country and Pick Number: Latvia ; Pick P- 36 First year of issue: 1992 Denomination and currency: 2 Rubli Issue type: uncirculated Signature(s): E.Repše;J.Ozoliņš Description of paper money: Banknote 1992; purple on brown-orange and yellow underprint. Series ML 699094. Back – purple on brown-orange and yellow underprint..Watermark: summetrical design. 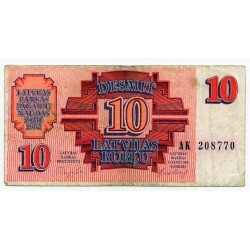 Country and Pick Number: Latvia ; Pick P- 38 First year of issue: 1992 Denomination and currency: 10 Rublu Issue type: circulated Signature(s): E.Repše;J.Ozoliņš Description of paper money: Banknote 1992; Purple on red-orange and pale orange underprint. Series AK 208770. Back – Purple on red-orange and pale orange underprint..Watermark: symmetrical design. 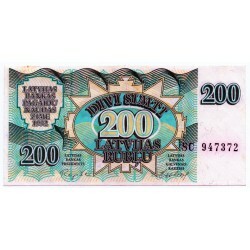 Country and Pick Number: Latvia ; Pick P- 39 First year of issue: 1992 Denomination and currency: 20 Rublu Issue type: uncirculated Signature(s): E.Repše;J.Ozoliņš Description of paper money: Banknote 1992; Violet on lilac and pink underprint. Series BS 156212. Back – Violet on lilac and pink underprint.Watermark: symmetrical design. 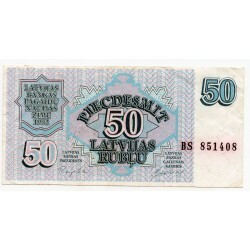 Country and Pick Number: Latvia ; Pick P- 40 First year of issue: 1992 Denomination and currency: 50 Rublu Issue type: uncirculated Signature(s): E.Repše;J.Ozoliņš Description of paper money: Banknote 1992; Gray-green and light blue and pink underprint. Series BS 851408. 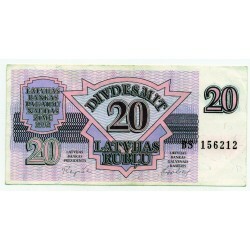 Back – Gray-green and light blue and pink underprint.Watermark: symmetrical design. Country and Pick Number: Latvia ; Pick P- 42 First year of issue: 1992 Denomination and currency: 500 Rublu Issue type: circulated Signature(s): E.Repše;J.Ozoliņš Description of paper money: Banknote 1992; Violet-brown on gray and dull orange underprint. Series RE 124130. 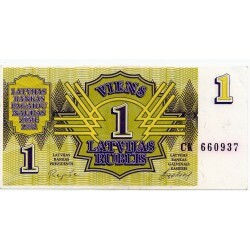 Back – Violet-brown on gray and dull orange underprint.Watermark: symmetrical design.